It was all about connections, this Cavatina concert. Only two instruments, both relatively simple but with a storied history: an acoustic guitar and a golden flute – what could be simpler? But what melodies and historical connections they produced! There were two musicians, connected by their countries’ surprisingly interwoven histories and cultures. Eugenia Molinar, flutist extraordinaire, explained to us that her husband’s Slavic aunt spoke archaic Spanish and that her own Spanish grandmother lit a Shabat candle every Friday evening; she didn’t even realize the significance of the candle but, like the music her own granddaughter now performs, the candle was engrained in her cultural memory from centuries past. 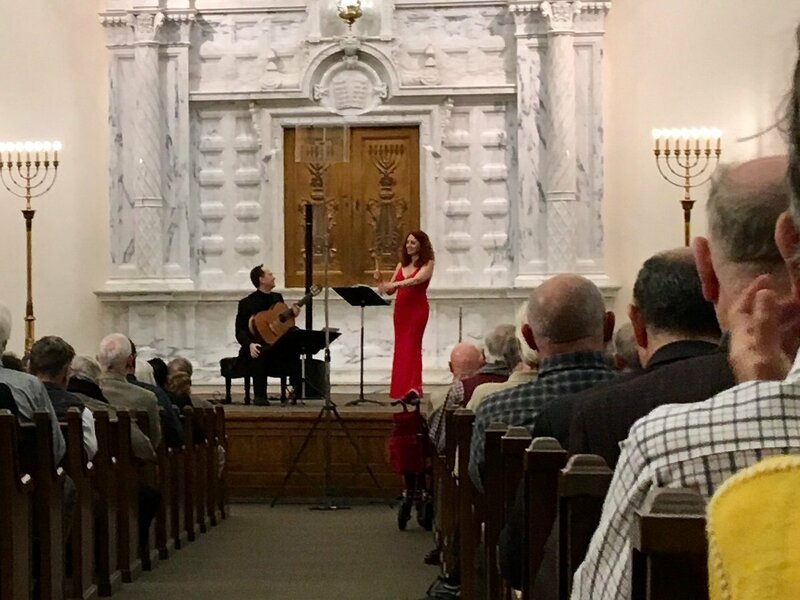 The richness of this program (which included music from the Seventeenth Century to modern music) kept the audience captive in its mastery and, more importantly, its warmth. The Temple was the perfect venue for exploring heritage. Denis Azabagic, despite his self-deprecating humor about his status as second fiddle to his wife’s golden flute, is quite obviously a master of the kind of quiet, lyrical and utterly magical guitar music this audience greatly appreciated. The two musicians together were able to spin a mystical web of swirling cadenzas, irresistible tangos and superb sound. The two musicians together were able to spin a mystical web of swirling cadenzas, irresistible tangos and superb sound. This concert was unique in that it presented the premiere of a work by Matthew Dunne. The connection between Mr. Dunne and the Cavatina is a close one and the duo had the pleasure of meeting the person in honor of whom Mr. Dunne composed his Three Artisans, flutist Tal Perkes. Matthew Dunne is also a well-known guitarist and has composed music for some of the best guitarists now performing; but this composition came straight from the heart. His good friend, Tal (a flutist with the San Antonio Symphony), was posthumously honored as artist, architect and flutist and his tribute was flawlessly performed by the Cavatina Duo. This was a different chamber music concert: only two musicians filling Temple with amazing technique and connecting with the audience in a particularly heartfelt way. I noted as well one more connection: when the Cavatina performed Isabel, by Joseph Williams, a piece inspired by Sephardic Jews who were driven from Ms. Molinar’s homeland of Spain in the Sixteenth Century, I remembered I had heard that this date, January 27th, marks the anniversary of the liberation of Auschwitz. And just as the ugliness of the death of Isabel, this young Jewish woman in Spain, the beauty of the music endures. Just as the sorrow for the death of a good friend and fellow artist saddens, he is immortalized in music.